Let’s hope that with this book (and similar efforts) social problem solvers can move from treating the symptoms to resolving root causes, and from changing politicians to changing the system. 3. As a 6" by 9" printed book from Lulu Press for $12.00 plus postage. If you want to see what the core of the book is about and save time, try the 7 page Scope and Introduction. For a peek at my personal ultimate dream, try the last chapter: The Tantalizing Potential of a Permanent Race to the Top, which runs just 16 pages. The book is an extended version of the Dueling Loops paper. The book contains about twice as much information about the Dueling Loops simulation model as the paper, including a third high leverage point not discussed in the paper. 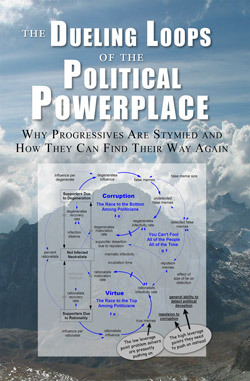 The book also takes the perspective that the sustainability problem is merely one of many typical problems that progressive activists around the world are working on. Most of these problems are symptoms of the deeper problem of a broken political system, which is why progressives are stymied. The Dueling Loops of the Political Powerplace is the name of the simulation model presented in the book. It's a simple enough model for most readers to grasp since it contains only two main feedback loops. These two loops are locked in a duel to the death for which loops can gain the most political supporters. Today The Race to the Bottom among Politicians loop is winning. This explains the mostly bad news we see every day, like the perfectly avoidable Great Recession of 2008 and the deplorable effects of rising income inequality, unemployment, and corruption. Every cloud has a silver lining if you can find it. The book contains good news as well. Opposing the race to the bottom loop is The Race to the Top among Politicians. The analysis shows why this is not the dominant loop, as it should be in democratic theory. The reason is the race to the bottom has an inherent advantage of the race to the top. This advantage has long remained invisible to even the keenest eyes. But now, thanks to the tools of root cause analysis, process driven problem solving, and model based analysis, the blanket has been pulled away. There is the structure of the problem for all to see in broad daylight. The inherent advantage of the race to the bottom is exposed. It's now in plain sight. This leads to the root causes, the high leverage point for resolving the root causes, and a few sample solution elements for pushing on the high leverage points. 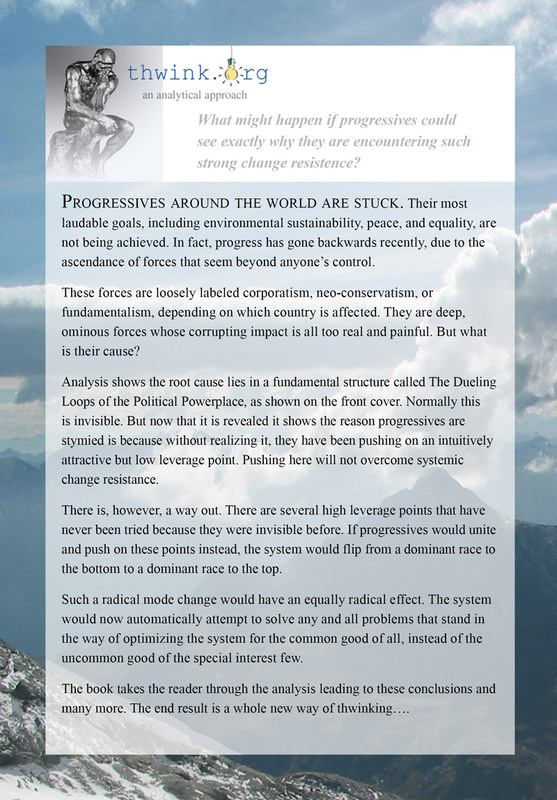 All this explains why progressives are stymied and how they can find their way again. WHY PROGRESSIVES ARE STYMIED is the root causes. HOW TO FIND THEIR WAY AGAIN is the high leverage points and sample solution element. Here's the back cover. 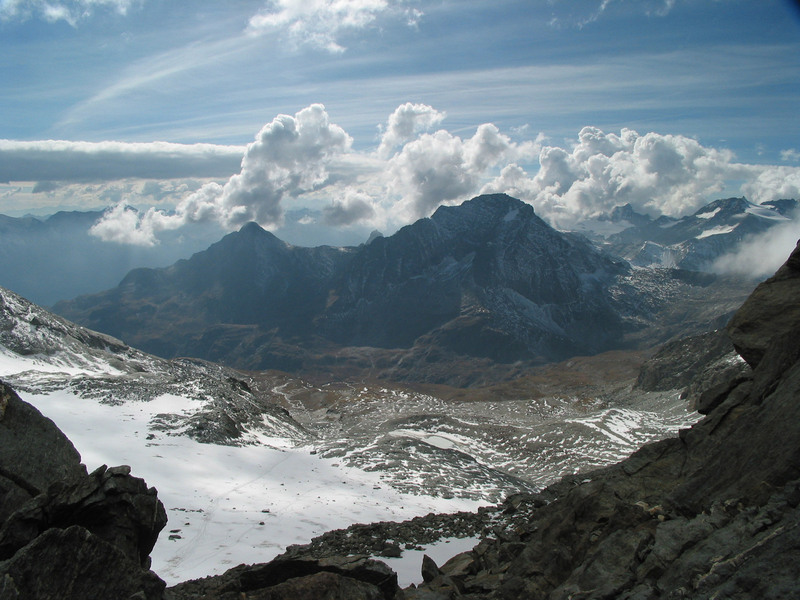 Click on it for the unretouched background photograph, taken by the author on October 3, 2002 from a ridge line near the top of La Dent Parrachee in Parc National de la Vanoise, France. Part 4: How Can We Apply This New Knowledge? The book uses the same simulation model as the one in the Dueling Loops paper and the Common Property Rights book. The difference is the Dueling Loops book and paper present only the simple aspects of the model and thus only the first 22 simulation runs. The Common Property Rights book present the complete model and all 41 runs. Here are the Vensim models ZIP used in the Dueling Loops book. For how to run them see The World of Simulation. Let us begin with what strengthens and weakens relationships. We start with what are popularly known as vicious circles and virtuous circles—terms that more or less started life with Systems Thinking. One of the most interesting terms used in Systems Thinking is the technical term for those circles: the feedback loop. In The Dueling Loops of the Political Powerplace, Jack Harich explains—in words of several syllables but in sentences that make complete sense—how feedback loops work in politics. Specifically, he explains why it is that politicians and the global political-economic system have failed to address 'the environmental problem' for the last 30 years (and particularly since the Rio Convention of 1992). The core of Harich's argument is the idea that, in democratic politics, two races can take place. They're the race to the top and the race to the bottom. The race to the bottom is characterized by the use of falsehood and favouritism. (Harich calls the two together 'corruption.') When this strategy prevails, politicians make false and/or unfeasible promises, they play of fear and create scapegoats (terrorism, communism, liberalism, etc. ), they campaign using half-truth and generalities and they rely on support that is bought or rewarded with political favours. In the race to the top, politicians will, by contrast, confront the truth and the harsh realities of any situation, they will make honest assessments of their motivations and their ability to achieve change, they will make realistic undertakings and they will appoint the best people for the job regardless of what favours they may owe.